While modern trucks are amazing machines that have been engineered to withstand incredible amounts of abuse, taking one simple precaution can help prolong not just the life and functionality of your truck, but also the way it looks. A Line-X spray-on bedliner is an excellent addition to any truck, no matter what you use your truck for. 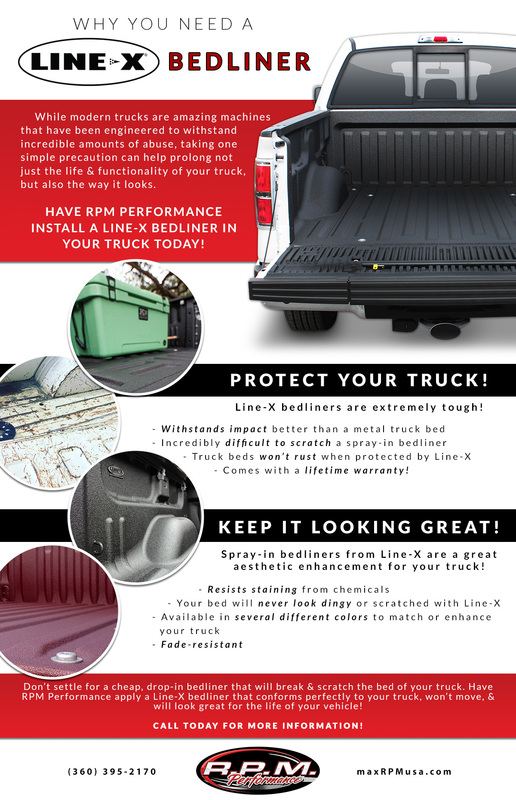 Everyone from the weekend warrior to the person who uses their truck for work every day can benefit from the protection and aesthetic enhancement of a spray-on bedliner from Line-X. Have R.P.M. Performance install a Line-X bedliner in your truck today! At R.P.M. Performance, we have dedicated ourselves to providing all of our customers with the highest quality truck accessories in the Burlington area. When you want to protect or improve your truck, trust us to handle the work. From collision repair to custom paint and window tinting, we do it all. Contact us today for find out how we can turn your truck into the perfect machine for you. Line-X bedliners are extremely tough! They withstand impacts better than the metal of your truck’s bed thanks to a special, proprietary material that was engineered to withstand the most common kinds of force that your truck might experience. It is incredibly difficult to scratch a spray-in bedliner and, when installed by the experts at R.P.M. Performance, it will also help to stop dings, dents, and other forms of abuse that nearly every truck experiences. Your truck bed won’t rust when protected by a Line-X bedliner, and each bedliner comes with a lifetime warranty. If the bedliner bubbles or cracks, we will fix it. Keep Your Truck Looking Great! Spray-in bedliners from Line-X are a great aesthetic enhancement for your truck because they will keep looking great even after years of use. They are fade-resistant, they resist staining from chemicals, and they make it so your bed will never look dingy or scratched up. Line-X bedliners are available in several different colors to match or enhance the way your truck looks, so you don’t have to worry about your truck looking boring if you have an awesome custom paint job. Don’t settle for a cheap, drop-in bedliner that will break and scratch the bed of your truck. Have R.P.M. Performance apply a Line-X bedliner that conforms perfectly to your truck, won’t move, and will look great for the life of your vehicle! Call us today for more information about a bedliner of any of the other truck accessories and services we provide. We are proud to be the Burlington area’s best source for high-quality auto-repair and enhancement services. When you need new wheels and tires, a lift kit, custom tuning, or many other SUV, car, and truck accessories, contact us. Our technicians have years of experience and they would love to do the job right the first time. When you choose R.P.M. Performance, you are picking quality. We have helped many people in the area create the perfect vehicle for their needs and we would love to help you, too.